Your business can benefit greatly from fiber-connected Internet. Does your business still rely on broadband Internet facilitated by copper cables? If so, you may want to consider upgrading to fiber Internet connectivity. This newer technology carries with it several advantages that can give your business a competitive edge. Here are a few business benefits you can experience by switching to fiber Internet connectivity. Do you ever notice the Internet slowing down just when your company needs it the most? Research from Sandisk shows that the average employee loses up to a week per year of productivity due to slow Internet speeds! 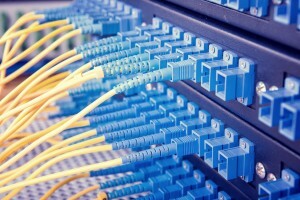 Fiber Internet connectivity offers speeds of 5Mbps to 100 Gbps, which is faster than even the best copper connections. During periods of high demand, you won’t have to deal with a temperamental Internet connection. Many modern businesses are staying competitive by using data storage and customer relationship management (CRM) tools that are hosted on the cloud. In fact, around 82% of businesses use the cloud in some capacity! Faster Internet connectivity from fiber cabling means that you’ll have fewer delays in accessing information hosted on the cloud, making it easier to utilize tools, apps, and information on the cloud on a daily basis. An Internet signal that relies on DSL or Ethernet over Copper degrades as the user moves further away from the switch. An Internet signal relying on fiber Internet connectivity, however, will maintain a strong signal over a longer distance. Businesses with large facilities can especially benefit from the stronger signal strength. Just as fiber Internet connectivity can facilitate faster Internet speeds, so it can also facilitate a greater bandwidth. This means that you can put greater stress on the network during times of high productivity without having to worry about “hitting the cap” on your data transmission. This entry was posted on Friday, March 10th, 2017	at 12:19 pm	. You can follow any responses to this entry through the RSS 2.0 feed. Both comments and pings are currently closed.